Though the Government has been according AoNs to the projected and necessary requirements of the Armed Forces, however, the follow up action on issuance of RFP and subsequent procurement steps is not keeping pace, resulting in derailing the procurements and further hampering the operational preparedness of the Armed Forces. Although the Indian defence services have drawn up elaborate plans for modernizing and upgrading their capabilities, however, the pace of modernization has been slow with the Armed forces being woefully short of essential weaponries at present which lowers not only operational/fighting efficiency but also its morale. One of the major reasons that can be attributed to it is the cumbersome and unrealistic weapons-buying/procurement process that the country has which is flawed by bureaucratic delays, timely decision making and poor long-term planning resulting in ageing inventory, over exploitation, lack of maintenance and spares. There is a need to fast track the acquisition process. Though, in some of the cases the Ministry of Defence (MoD) may have valid reasons to hold the process of procurement, however, in number of cases, delay could have been avoided, if the concerned authorities, at various stages, had followed the timeline. The first step towards formulating the proposal for any procurement is framing of the basic Services Qualitative Requirements (SQRs) followed by Acceptance of Necessity (AoN), which pave the way for the tendering process to start. 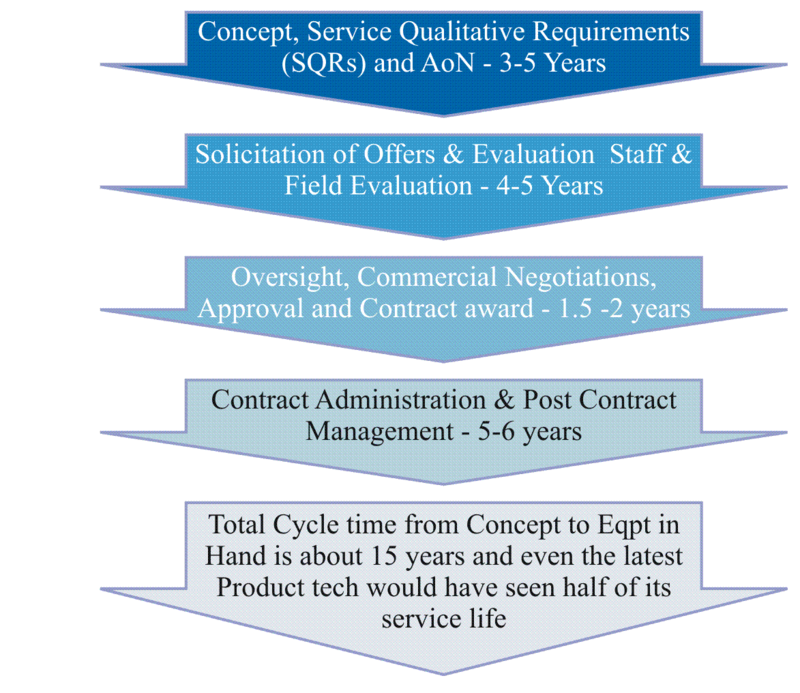 The figure depicts the major activities of the procurement process cycle and usual approximate time taken at each main activity for a major platform. The DPP estimates that the entire procurement process comprising of 17 stages from granting of AoN to RFP to contract inking could take up to two to three years but in actual practice, it takes over 5 years for the Government to purchase even simple items like ballistic helmets. On the backdrop of the obsolete and lack of weaponries with the Armed Forces, the previous Indian Governments had undertaken various procurements and initiated by granting AoNs to number of defence procurements, however, it has been seen that in most of the cases though the AoN has been issued but it gets lapsed before the issuance of RFP itself and thus in last few years there has been no single big ticket defence contract inked by the country for the Armed Forces. The new Government has expressed its desire to put the defence acquisition process on track while promoting indigenous defence industrial base. To begin with, it built a momentum by clearing and granting AoNs to prolonged and necessary defence projects worth Rs. 3.1 lakh Crores ($47 billion), however, none of these have reached the stage of issuing of the tender, let alone signing a contract and implementation till date. The plight is that the defence proposals in pipeline are still stuck at the AoN stage especially some of them are quite critical. Also, the approvals/clearances only reflect the start of the procurement cycle which may extend up to three years or more. Acquiring defence capability and maintaining operational preparedness cannot be done by way of merely sanctioning of proposals but what matters is making a decisive difference by accelerating the next steps of the procurement cycle. Basically, the follow-up has been at a snail's pace, resultantly, there being no significant progress on issuance of RFP on the projects granted AoN even after months. The case of Project 75I under which six new advanced stealth diesel-electric submarines are to be built for the Indian Navy substantiate this fact. The AoN for the Project 75I has lapsed number of times and thus the procurement process has remained stalled over the years due to which the Navy submarine fleet strength is precariously low at 13 vessels against the requirement of a fleet of 24 submarines. This project first had got AoN way back in November 2007 but since then awaiting issuance of tender. The programme now is expected to cost Rs 80000 Crores which was initially to cost Rs 50000 Crores years back, had timely decision with regards to issuance of RFP had been taken after the granting of AoN. Not adhering to the timeline has resulted in steady decline in the number of procurements in the past few years. The time taken to procure the weaponry/system turns out to be so long that by the time it is inducted the technology is due for upgrade and it has already crossed almost half of its technology shelf life. The procurements for the Indian Armed Forces are not 'state-of-the-art' or hi-tech equipments but rather comes under the segment of medium-technology equipments owing to considerable lack of technology sharing and affordability by the country. If we take into account the time Indian procurement process it takes around 10-15 years or so to get the equipment. So by the time the Armed Forces get the desired equipment, it has already crossed almost half of its technology shelf life. Our procurement procedures and the methodology of induction of new weapons and other systems definitely need to be streamlined. The delayed procurement process not only derail the modernization plans of three services but also result in serious fallouts by way of time and cost overruns, besides the inducted technology becoming outdated. In the present procurement methodology, the numerous procurement functions are dispersed between the service headquarters and the acquisition wing of the MoD. However, the Director General (Acquisition), who heads the acquisition wing does not have the full responsibility to ensure accountability, as many of the acquisition functions, such as formulation of QRs, trials, offsets etc, are beyond its power and purview. In other words, if something goes wrong, there is not a single authority other than the defence minister that can be held responsible. There are too many committees with multiple members, each having its own interest. The Offsets are responsibility of DDP, which is more concerned with production in Govt sector and not much interested in creating capability. The Govt needs to decide who will have the lead role in final decision in creating capability. Government should try and lessen the numerous committees that a defence proposal has to go through as this will help in reducing the time. Further, every acquisition that gets inordinately delayed or cancelled must be questioned and should be analyzed to identify the reason and thereafter necessary and immediate action should be taken. The Government must thus take all requisite steps to ensure that unnecessary delays are avoided and the timeline are adhered. The need of the hour calls for the fast pacing the procurement process and to supplement it with committed funding. To curtail the delays in procurement from vendor's side, it is essential to choose only capable and reputed vendors after thorough analysis.